In the existing article we had put together a chart of excellent concert ukuleles, and little had changed. However, we swapped the innovative Lanikai TunaUke SMTU-C with the gorgeous Lanikai QM-BLCEC, while we also added another uke – the affordable Cordoba Protégé U100CM. On the hunt for a new ukulele? Whether you’re a complete beginner or an experienced player, a concert ukulele is perhaps the most versatile of the four main uke sizes – a great all-rounder. What Makes a Concert Ukulele? What Does a Concert Ukulele Sound Like? Introduced in 1920, the concert – also known as the alto ukulele – was offered as a larger alternative to the traditional soprano ukulele and it proved successful, as it’s still one of the most popular sizes nearly 100 years later! When looking in stores, both online and physical, many of the models you’ll see will be concert ukuleles. In fact, you may be overwhelmed with the choice of concert ukes, all differing in prices, construction woods, styles, and electronics. So, we’ve constructed a short chart to highlight eight of our favorite models, reflecting a cross-section of the current market. There are some budget models, some higher end; some traditionally designed, some more modern; some with electronics, some without. But they all share one common factor – they are concert size! Browse the chart, then check out our guide to concert ukuleles below. Can you hear the ocean? Luna’s Dolphin gets you one step closer! A quality concert uke that marries style and substance. A durable and travel-friendly semi-plastic uke – made in America! Great looks, playability and sound – a good all-rounder from Ibanez. A beautiful beginner’s model with great quality in build and sound. 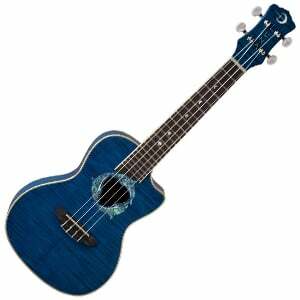 Awesome value on offer from this tattooed Luna uke. A real rock icon, repackaged as a budget concert uke! Part of Lanikai’s ‘Sun, Sand and Surf’ series, the ocean-inspired QM-BLCEC electro-acoustic is a premium concert uke that shows off gorgeous design and a high-end construction. The top, back and sides of the body are crafted from quilted maple laminate, with a glossy translucent blue stain which really catches the eye. But there are more than just good looks on offer with this lovely uke, as the playability and craftsmanship really impress – as does the hardware. It’s kitted out with a quality Fishman preamp and controls, and delivers a beautiful sparkly traditional concert uke tone. Be sure to check out the full review of Lanikai’s QM-BLCEC for the lowdown on this cool uke. Unsurprisingly, the most eye-catching ukulele in this chart of top concert ukes is from Luna Guitars, who lead the pack in the looks department. This marine-themed beauty features a high-gloss trans-azure finish on the laminated maple body, as well as a flamed maple top to give the illusion of waves. On these waves, a trio of dolphins swim around the soundhole, which is a cool addition. But it’s more than just style, as this electro-acoustic uke comes with Luna’s UK-T2 preamp and pickup, with 2-band EQ, to amplify the naturally bright tone. It also comes with a gig bag. Be sure to check out the full review of the Luna Dolphin for all the details! An impressive high-end entry on our chart from Fender, with the Mino’Aka electro-acoustic concert ukulele. Mino’Aka means ‘to smile’ in Hawaiian, and this concert uke certainly allows player to do that, with an eye-catching laminated koa body, dressed with some lovely detailing, such as aged body binding and an abalone acrylic rosette. However, the most notable design point is that iconic Telecaster headstock at the top of the three-piece mahogany neck, which instantly announces that it is a Fender. The sound on offer is great – as we highlight in the Mino’Aka’s Full Review – and can be enhanced through the quality Fishman Kula pickup/preamp system, which comes with 3-band EQ and a handy built-in digital tuner. Smiles all-round! The Magic Fluke Company offers something a little different in the concert uke market – an affordable American-made uke with a unique style. Sounds good so far! As we highlight in the full review of the FLEA Concert ukulele, the almond-shaped body of this ukulele features a durable injection-molded thermoplastic on the back and sides, with a laminated birch top, finished in a choice of colors. There’s also a hard maple neck, with a finger-friendly polycarbonate fretboard and 15 molded frets. It’s great for travel, and sounds good too, with a bright and happy tone. A uke with a feel-good factor – especially when you consider that the company also donate these instruments to children’s charities. Although very well-known for their awesome electric guitars, Ibanez are no strangers to the world of acoustic, and hit this chart with an excellent all-rounder in the UEW15E. With a concert uke-sized EW Series shape body, including distinctive cutaway, the top, back and sides are made from a lovely laminated flamed mahogany. It features an open-pore finish and ivory binding, and looks very elegant, while playability – thanks to the mahogany neck and 19 frets – is very good indeed. The uke sounds great acoustically, but can be amplified via the Ibanez UK300-T preamp, with 2-band EQ controls and an on-board digital tuner. You can check out the full review of the Ibanez UEW15E, for everything you need to know. With a sub-$100 price tag and great playability, the Cordoba Protégé U100CM is perfect for beginners looking for a quality concert uke on which to practice and perform. Even though there’s little in the way of glamour, the U100CM sports a lovely traditional design with a satin-finished laminated mahogany body, a mahogany neck, and a rosewood fretboard with 18 frets. For an affordable ukulele, the sound on offer is surprisingly good, with a crisp jingle that beginners and experienced players would appreciate. The hardware is also commendable, while it also comes with an included gig bag for easy storage. For all the details you can read our full review of the Cordoba Protégé U100CM. Another Luna model makes its way onto our chart of the best concert ukuleles, although this is a much more budget-focused uke, coming in at under $100. However, it still shows off an inventive and eye-catching design, with a Hawaiian body ornamentation-inspired tattoo laser-etched onto the laminated mahogany body. The mahogany neck also features some cool detailing, with shark tooth inlays on the rosewood fretboard. As we mention in the complete Luna Tattoo Concert review, there’s plenty of warmth and richness in tone, which is surprisingly good for such a budget uke. Throw in a decent set of open-gear tuners, a graphite nut, and a basic nylon gig bag, and the value is clear to see. We love a wildcard, and this cute electro-acoustic concert uke from Epiphone is pretty wild! You don’t need to be an expert guitarist to recognize the iconic Les Paul shape this ukulele features, with a body made from solid mahogany and a flamed maple top. The mahogany neck features the brand’s classic SlimTaper D profile, with a rosewood fretboard and 19 silver-nickel frets. In the electronics-department it comes with an undersaddle piezo pickup, although lacks any volume or EQ controls, which is a bit of a shame. Still, it does come with decent tuners and a gig bag, and – for just over 100 bucks – shows great value, as we highlight in the full review of this Les Paul ukulele. While there are little differences between some manufacturers, a standard concert ukulele will be around 23” in total length. A concert ukulele will also typically have around 15 to 18 frets, although some models will have more. As for tunings, the normal concert uke tuning is G-C-E-A, which is identical to soprano and tenor models, so making the change from any of these sizes is a cinch. As with any acoustic instrument, much of how it sounds is a result of what woods are used in the construction of the body, as well as whether it is made of solid or laminated material. However, when it comes to a concert ukulele, compared to a smaller soprano uke, the sound will be deeper and richer. You still get the classic bright and tinkly ukulele tone, but with a slightly bigger sound that projects better. On the other hand, compared to a larger tenor or baritone ukulele, the concert is quieter. But in general, a concert ukulele provides a versatile, middle-of-the-road sound. As we’ve established, a concert ukulele sits in the middle of the size spectrum, so is a great compromise between a soprano and a tenor. You’ll find concert ukes offer you a great market to choose from compared to some other sizes. For example, some brands offering unique models, such as the FLEA Ukulele or Epiphone’s Les Paul Uke, only offer their models as concert size. So, for picking up something which will turn a few heads, narrowing your search to concert is a good start. A concert uke will typically feature a length of around 23”, and a scale length (the distance from the nut to the saddle) of 15”, which boils down to a slightly longer neck and wider fretboard than a soprano. This means there is more room to maneuver, with the frets marginally further apart from each other, so players with average-sized adult hands would struggle less than they may with a soprano uke. A concert ukulele also offers a wider range of notes than a soprano, due to the additional frets, so it gives you more scope for making music. And, like a soprano, a concert is still quite compact, so it’s good for travelling. A final advantage is that a concert ukulele will be cheaper than a baritone or tenor of the same model. On the flip side, however, the concert version will generally be more expensive than a similar soprano model. A concert ukulele is very versatile, and particularly good for beginners, but it’s not for everyone. If you want something with a deeper, richer tone, and more acoustic projection, a tenor or even a baritone ukulele is the size to consider. The added advantage of these ukulele sizes is that they are excellent for those players with larger hands, or guitarists trying a ukulele for the first time. On the other side of the coin is the soprano, which would suit you if both your budget and hands are smaller! When it comes to buying a ukulele, there is no right or wrong. However, if you are a beginner, a concert uke is a great place to start. As we’ve highlighted several times throughout this review, a concert size gives you a typical ukulele sound with a little more depth than a soprano, along with a bit more playability. Before you buy, make sure you read some reviews of your favorite-looking ukes, watch videos of them in action, and – if possible – try some out. Just don’t forget to come back and thank us when you’re wowing your audience with a great ukulele!